Webster defines pre-eminent as: excelling above all others. Pre-eminent aptly describes the University of Georgia’s Claude Felton. Serving the UGA Athletics Association for more than 30 years, the legendary Felton is generally regarded by knowledgeable observers as the standard by which collegiate sports information directors are measured. Claude Felton received the FWAA’s Bert McGrane Award in 2008. Aptly aided by a staff of full-time, part-time and student assistants, Felton’s primary responsibility is to chronicle and disseminate information about the UGA intercollegiate sports teams and student-athletes to media on local, state, regional, and national levels as well as Bulldogs fans and all others who request it. He is the consummate professional — well-organized, thorough at handling details and performing his job with an objective approach. Felton is quick to deflect any credit for his efforts while devoting his attention to getting out information about the Bulldogs’ newsworthy deeds. Felton’s career has spanned the glory days of UGA Athletics. He has directed the overall publicity operation for thirty-plus national championship teams, including the school’s fifth national football championship, as well as numerous individual national champions. During his tenure, UGA Athletics highlights have also included the greatest play in Bulldogs Football history (the Buck Belue-to-Lindsay Scott 93-yard miracle touchdown pass that helped push UGA past hated Florida, 26-21 in 1980 and propelled the Bulldogs to the national title), running back Herschel Walker winning the 1982 Heisman Trophy and the men’s basketball team making its only appearance in the NCAA Tournament’s Final Four (1982-83 season). Felton enthusiastically recalls the exploits of UGA’s top coaches like Vince Dooley, Hugh Durham and Jack Bauerle as well as the exploits of the best athletes to play for the Bulldogs such as Walker, Belue, Terry Hoage, Kevin Butler, David Pollack, Todd Gurley, Aaron Murray, Dominique Wilkins and Katrina McClain. Equally special to Felton are the athletes whose names don’t evoke as much fanfare as the star performers, but who nevertheless make meaningful contributions to their respective UGA teams. Felton also realizes the importance of devoting proper attention to all UGA sports — not just the glamorous ones like football and basketball — and he makes sure UGA women’s sports receive equal attention to the men sports. A Savannah, Ga., native, Felton enrolled at UGA in 1967 and earned Associate Bachelor’s (1970) and Master of Arts (1971) degrees from the Henry Grady School of Journalism. Felton was a summer intern sports reporter and later briefly a news reporter for the Savannah Morning News (1971). He then worked two tenures in various posts at Georgia Southern College, including Director of Information Services, Sports Information Director, Associate Director of Institutional Development, and Director of Public Relations. Additionally, he was an assistant tennis coach at the school from 1972 to ’75. Felton also was assistant sports information director at UGA and in ’79 he became its Sports Information Director, a capacity in which he has served since. He has witnessed the most significant changes in the sports information business — especially the explosion of sports on television to the growth of media covering college athletics to the Internet’s role in them. As a result, Felton has upgraded many services provided by the UGA Sports Communications (formerly Sports Information) Department and he and his staff have been honored with dozens of national and regional awards from the College Sports Information Directors of America for the slick media guides, game programs and related publications they produce. Another example of the astute work of Felton and his staff is provided by the Football Writers Association of America in its “Super 11” listings of the top eleven sports information departments in the NCAA Football Bowl Subdivision. Georgia is the only school that has received “Super 11” recognition every year (five) since its inception in 2009. Selection criteria includes: how efficiently press boxes/operations are operated; quality and timeliness of information provided; amount of information presented and how appropriately it is updated on web sites; personal responsiveness to media inquiries as well as the accessibility of players and coaches; and how well the sports information departments go the “extra mile” in servicing the media. No one who deals with college sports information departments should be surprised that UGA has accomplished such a prestigious feat and that is largely because of Felton’s leadership. 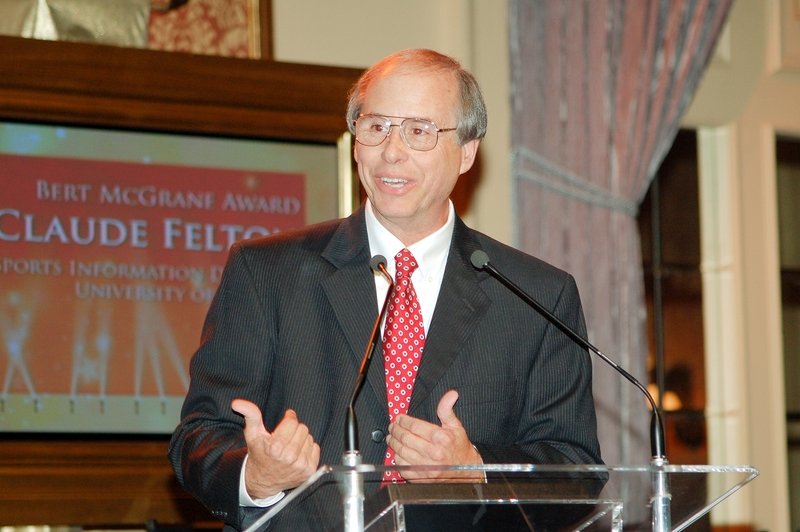 Felton has served as media coordinator for numerous NCAA national championship events held at UGA and was the host sports information director for the 1977 NCAA Final Four basketball tournament in Atlanta. He was also a member of press liaison staffs for various Olympic Games, including in 1984 in Los Angeles and as press venue chief for soccer at the ’96 Centennial Olympic Games held at UGA. Additionally, Felton was chairman of the Ethics Committee of the College Sports Information Directors of America (CoSIDA) from 1985 to ’91 and chairman of the organization’s Olympic Liaison Committee (1992-95). He has also served as a member of the NCAA Men’s Basketball Final Four media coordination committee since 1995. After hiring Felton as UGA’s Sports Information Director, then UGA Athletics Director for Sports Dooley rewarded Felton for his work with job promotions four different times, culminating with him also being named Senior Associate Athletics Director for External Affairs, a role in which he served four years (2000-04) and not only oversaw the sports information department, but also the athletics ticket and development offices. Felton had previously been Associate Athletics Director for External Affairs for two years (1998-2000), Associate Athletics Director for Sports Information four years (1994-98), Assistant Athletics Director for Sports Information 10 years (1984-94) and SID for five years (1979-84). His job title changed to Associate Athletics Director and Sports Communications Director in 2004, and he was promoted to Senior Associate Athletics Director (in addition to SC Director) by UGA Athletics Director Greg McGarity in 2011. Felton’s contributions to UGA and Bulldogs Sports are so numerous that it’s a general consensus among his peers and colleagues as well as others familiar with his work that UGA should name a facility for him or honor him with a comparable milestone. Felton achieved the pinnacle accomplishment of his professional career on July 4, 2001, when he was inducted into the College Sports Information Directors of America Hall of Fame, acknowledging his exemplary work at UGA and showcasing the high esteem in which he is held by his colleagues. He also received the CoSIDA’s next most prestigious honor in 2004 — the Arch Ward Award — presented annually to an individual who has made an outstanding contribution to the college sports information field. Additionally, Felton was the 2008 recipient of the Football Writers Association of America’s Bert McGrane Award, which is presented to an FWAA member who has performed great service to the organization and the writing profession and is symbolic of the association’s Hall of Fame. It is named for the Des Moines, Iowa, writer who was executive secretary of the FWAA from the early 1940s until 1973. Truly, Felton is a Southern gentleman whose class, humbleness and congenial personality endear him to those with whom he comes in contact. He’s also a great family man. Felton is married to the former Cathy Turner of Athens. She is an administrative assistant in UGA’s Crop and Soil Sciences College. Claude and Cathy have three children symbolic of the association’s Hall of Fame that — Robyn, Christopher and Patrick. Robyn is a 2000 Samford University graduate who currently is a vice-president for the Colonnade Group in Birmingham, Ala. Christopher, a 2001 UGA graduate, was a former administrative intern to Dooley and certified athletics trainer for the Bulldogs. He attended medical school in Miami and Fort Lauderdale, Fla., and currently is fulfilling his medical residency at New Hanover Regional Medical Center in Wilmington, N.C. Patrick, a 2010 UGA graduate, recently completed an internship at the Allstate Sugar Bowl office in New Orleans, La. Claude and Cathy have one grandchild — Carter Christopher Felton — born to Christopher and his wife, the former Katie MacKelcan, in August 2011. What Claude Felton has accomplished for UGA has, indeed, been of colossal and even historic proportions. And the university has never employed a more loyal servant or a better person.